Windak Inc. welcomes all visitors to our booth 1940. Windak specialises in automatic packaging solutions for the wire and cable industry and has offices in Sweden, USA, Australia and Estonia. loads and unloads the empty reels automatically. Includes stretch wrapping of spool to contain the cut end. The output of the machine is 2 reels per minute! with a short investment payback. They also will show the winding process and palletizing of the finished spools! Windak will participate together with AXJO America company. Brazil and Africa and now it has a production factory in North Carolina, USA. 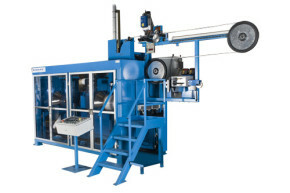 Windak will also present the latest information about our full range of products such as; pay-offs, take-ups, rewind lines, coiling and spooling solutions, accumulators, and palletizers. Our experienced and friendly sales- and engineering team will be ready to discuss your need in detail.